ATKINSON — A Henry County native has made history by becoming the first woman to preside in a Stark County courthouse. Suzanne Patton said she was in grade school in Atkinson when she began thinking about pursuing a legal career. 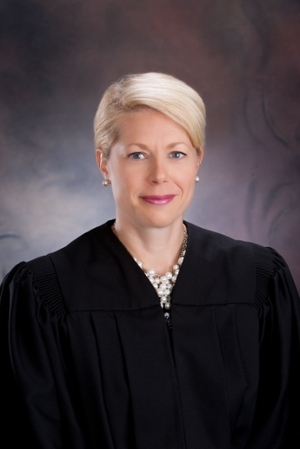 The daughter of Greg and Sally Patton, the 1992 Geneseo High School graduate became an associate judge in Peoria County in 2016. Currently assigned to domestic relations court in Peoria County, Patton said serving in Stark County was a little like coming home. She substituted for Circuit Judge Circuit Judge Steve A. Kouri in Stark County. Before Patton was assigned to that bench, the presiding judges there all had been men. Patton said she had had no problems as a female judge. Patton grew up outside of Atkinson, doing chores on a local hog farm and detasseling seed corn for Wyffels Hybrids. It was during that time, she said, when she decided higher education would lead her to bigger and better things. “When I was in fifth grade, I began to think about pursuing a legal career,” she said. “I had a strong passion for justice and the knowledge that I would be able to be both empathetic to people in highly vulnerable times of their life, and still be firm and fair in dispensing justice. “By the time I had graduated from high school, two of my brothers were pursuing legal careers as well,” she said.